Mc,Rd is the design moment resistance of the beam cross-section, reduced if necessary to allow for shear, see EN 1993-1-1. For a haunched beam McRd may be calculated neglecting the intermediate flange. f is the flange thickness of the connected beam. If the height of the beam including the haunch exceeds 600 mm the contribution of the beam web to the design compression resistance should be limited to 20%. - the length of stiff bearing ss should be taken as equal to the thickness of the haunch flange parallel to the beam. (3) If a beam is reinforced with haunches, the design resistance of beam web in compression should be determined according to 6.2.6.2. (2) The effective width beff,t,wb of the beam web in tension should be taken as equal to the effective length of the equivalent T-stub representing the end-plate in bending, obtained from 6.2.6.5 for an individual bolt-row or a bolt-group. (1) The design bearing strength of the joint between the base plate and its concrete support should be determined taking account of the material properties and dimensions of both the grout and the concrete support. The concrete support should be designed according to EN 1992. (2) The design resistance of concrete in compression, including grout, together with the associated base plate in bending _Fc,pl,Rd, should be taken as similar to those of an equivalent T-stub, see 6.2.5. (1) The design resistance of a base plate in bending under compression, together with concrete slab on which the column base is placed -Fc,pl,Rd, should be taken as similar to those of an equivalent T-stub, see 6.2.5. (1) The design resistance and failure mode of a base plate in bending under tension, together with the associated anchor bolts in tension -Ft,pl,Rd, may be determined using the rules given in 6.2.6.5. (2) In the case of base plates prying forces which may develop should not be taken into consideration. (1) Anchor bolts should be designed to resist the effects of the design loads. They should provide design resistance to tension due to uplift forces and bending moments where appropriate. 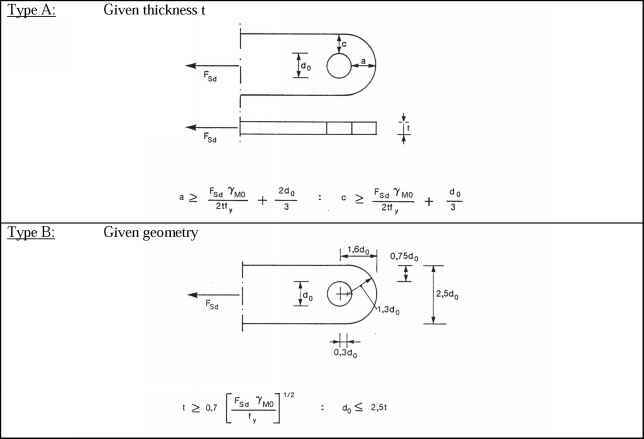 (2) When calculating the tension forces in the anchor bolts due to bending moments, the lever arm should not be taken as more than the distance between the centroid of the bearing area on the compression side and the centroid of the bolt group on the tension side. NOTE: Tolerances on the positions of the anchor bolts should be taken into account if the influence of tolerances is significant. (3) The design resistance of the anchor bolts should be taken as the smaller of the design tension resistance of the anchor bolt, see 3.6, and the design bond resistance of the concrete on the anchor bolt according to EN 1992-1-1. - some other fixing which has been adequately tested and approved. (5) When the bolts are provided with a hook, the anchorage length should be such as to prevent bond failure before yielding of the bolt. The anchorage length should be calculated in accordance with EN 1992-1-1. This type of anchorage should not be used for bolts with a yield strength fyb higher than 300 N/mm2. (6) When the anchor bolts are provided with a washer plate or other load distributing member, no account should be taken of the contribution of bond. The whole of the force should be transferred through the load distributing device.